We’d like to introduce linguist Juventino de Jesus Pérez Alonzo, who was with out chief operator José Reynès. Juventino here presents Tektiteko: one of the Mayan languages among the most threatened in Guatemala. 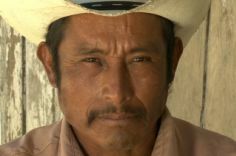 With around 2000 speakers, this language of the Mam’ branch is greatly influenced by Spanish, and transmission of the language as well as the culture of the Tektiteko aren’t really ensured anymore. A villager from Tectitan tells us about the culture of corn, the right time to sow, the harvest, the celebration that follows, and the contemporary changes undergone by local methods of cultivation, especially regarding the use of fertilizers and herbicides. In the following video, we turn it over to a Tektiteko potter from Guatemala describing the whole production process from clay to sale! Also a way to discover the simple yet harsh lifestyle of the inhabitants of Tectitan in the light of beautiful footage by José Reynes.